A quick oddity that I found! Not even at the super-exotic place - these were in the fruit section of Whole Foods. At first glance, these look like the kind of peppers that would literally blow your head off if you put more than one in your mouth at a time - and for that reason I was kind of hesitant to try them. 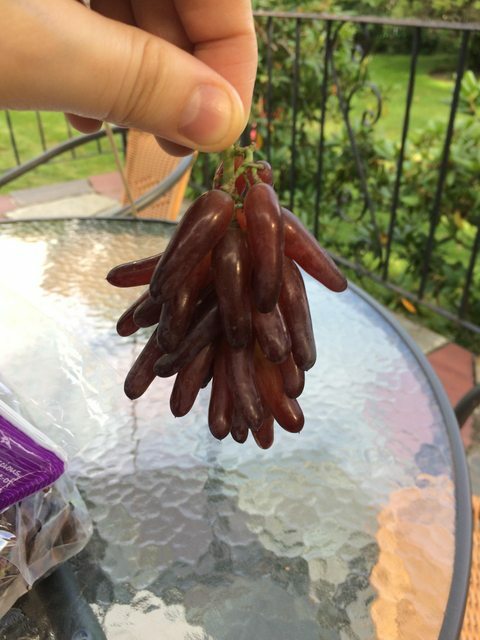 But they're a species of grape - Teardrop Grapes, which have also been called Witch Finger Grapes before someone from marketing decided to make them sound more appetizing. They taste very much like sweet red grapes, and so I thought this post would end on an anticlimactic note. But when looking for more information, I found that this is the first example I've found of a proprietary fruit! They didn't exist at all before 2002, when a farm in California called the Grapery began growing them through selective breeding, and they're still only available through that one farm. They have multiple varieties of grapes that they've invented with their mad grape Frankenstein science, each with a very limited window of availability each year - Teardrop grapes are only around for a month out of the year, from mid-July to mid-August, so the window is closing on them already. There's an article about them in Bon Appetit here - what a fascinating find.